X-Ray images xray of unusual objects. Xray radiographs. 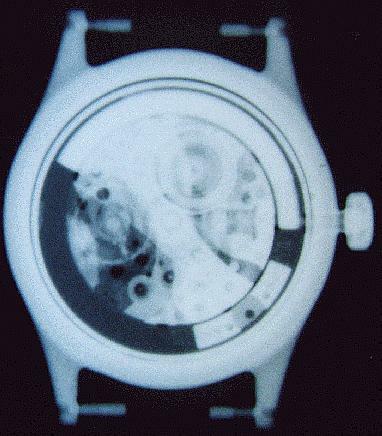 Above is a radiograph of a 17 -ewel Bulova wristwatch. See below for another watch. 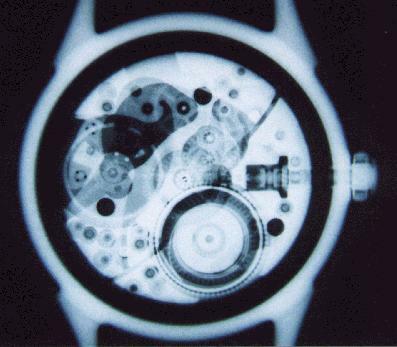 The caseback was removed for the exposure. You can see the mainspring in the lower picture, just to the right of midline. It is mostly wound up. As the watch releases power, the coils of the spring will migrate to the outside of the wheel it lives in. The balance wheel is at the 9 o'clock position. If you wish to learn more about the technique for obtaining this image, click here. This exposure came out a bit light, but I think you can still see things. This is a bumper automatic watch. See here for more info on automatic movements, inlcuding photo of a bumper movement. The weight is a C-shaped metal mass in the upper peripheral aspect of the case. You can barely see it, but it is attached to the center of the movement with a plate. It moves back and forth in the channel where you see a lot of dark. As it moves, it winds the mainspring, here shown as the veiled coil at 12:30. The small arc of metal at 5 o'clock does not move, but it has a spring on each end. Some of the momentum of the rotor weight is transferred to the spring as the rotor smacks into it. The balance wheel is at 9 o'clock.